During the Boston Celtics vs. the Miami Heat game 1 playoff game, the tension between these two teams showed in a big way. Tempers flared after Paul Pierce tumbled to the ground in front of the Miami bench with an apparent right shoulder injury with 40 seconds to play. 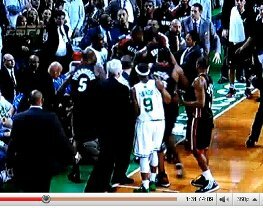 Miami’s Quentin Richardson stood defiantly over Pierce and suggested he was exaggerating the injury, to which Kevin Garnetttook umbrage, expressing it with an elbow to Richardson’s head when pushing and shoving ensued. Before Saturday, the Celtics and Heat didn’t have any playoff history. But in the fracas that ensued in the waning moments of Boston’s 85-76 Game 1 triumph, this series ratcheted up to an intensity typically reserved for Celtics-Lakers.